Navigate the messy world of modern relationships with advice from the iconic characters of the hit 90s Nickelodeon TV show Hey Arnold!. For everyone who thought that embarrassing crushes and awkward dates would be left in the school yard, the Nickelodeon Hey Arnold! Guide To Relationships Hardcover Book is the must-have handbook on matters of the heart. 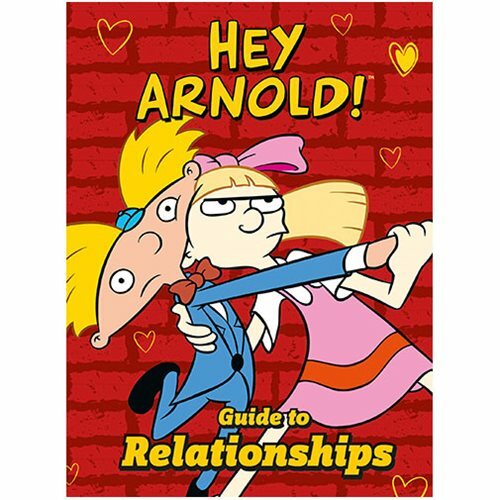 Whether it is uncovering true relationship goals with Grandpa and Grandma or pursuing the object of your affection with the single-minded dedication of Helga Pataki, let Arnold and the gang help you find happiness, not heartbreak. The perfect gift for the football head in your life, this lively and straight-talking book takes a trip down memory lane with hilarious moments from the original animated series. The Nickelodeon Hey Arnold! Guide To Relationships Hardcover Book is 64 pages. Measures about 7 3/10-inches tall x 5 2/5-inches wide.